Endive Seed delivered direct by D.T.Brown seeds. 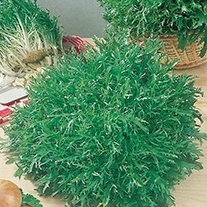 Endive is grown as a cut and come again crop, producing attractive leaves for use in dishes such as salads. Many growers will blanch the plants before harvesting to enhance the flavour. Endive grows best in well-drained soil and is usually sown from April to July. Sow seeds thinly at a depth of approx. 1cm (0.5in) in rows that are 30cm (1ft) apart. Plants are generally ready to harvest approximately 80 days after sowing and it is important to keep plants thoroughly watered, especially in dry weather.